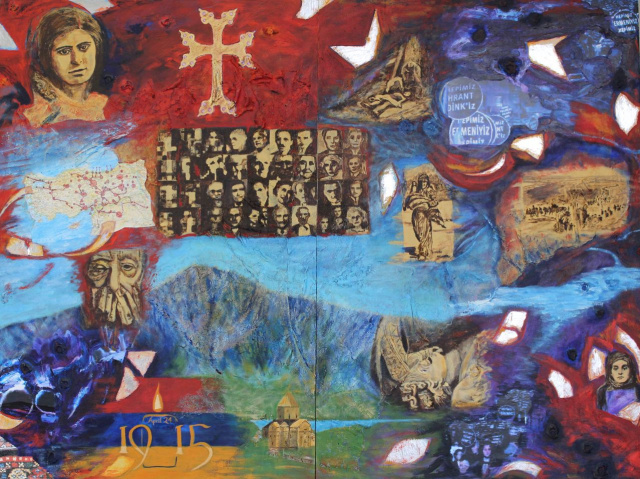 "High Park artist’s mixed-media piece commemorates 100th anniversary of the Armenian Genocide"
Religion is at the heart of Armenian life and is represented here by the Armenian cross, which has a distinctive design with ornamental decoration at each of the four ends. This is a more restrained example. Armenians are said to be the first Christians, and there are Armenian sects today that speak the ancient language that was used in Biblical times. The simplicity and honesty of this archival photo is arresting. The image is reduced to hands covering a bent head, arms propping up the head, and a lifeless, emaciated, uncovered child in the foreground. Hrant Dink was a Turkish-Armenian journalist living in Istanbul who was shot dead in the street outside his office in January, 2007. He was editor of the newspaper Agos; it is significant that the paper is published in both Armenian and Turkish in an effort to bring understanding between the two communities. He and his fellow journalists expressed the view that a genocide had occurred against the Armenian people 100 years ago. In Turkey, even today, that statement is a punishable crime against the State. The funeral was like a State funeral, bringing thousands into the streets and closing down the city. People of all backgrounds and convictions protested against his assassination, waving banners proclaiming “Hepimiz Hrant Dink’iz” (“We are all Hrant Dink”) and “Hepimiz Ermeniyiz” (“We are all Armenians”). In the foreground of this archival photo is a figure stooped over, carrying her life possessions. Just behind is an authoritative figure giving an order. In the mid-distance and on, in a line of tiny specks that moves to the horizon, are Armenians being forced to abandon their homes. The landscape is desolate and miserable. On the left are Turkish soldiers with horses and carts. © Armenian National Institute, Inc. Armin T. Wegner & Wallstein Verlag, Germany. The composition of this photograph emphasizes the strength and composure of this determined young Armenian woman. Contrasting bands of black and white highlight the drama of the scene, the heat and the futility. Arshile Gorky, born in Armenia around 1904, escaped with his mother in 1915 into Russian territory. His mother died of starvation there in 1919. Gorky immigrated to the U.S. the following year and later became a well-known Abstract Expressionist painter. Gorky transformed their story, his loss and memories into works of art. Hrant Dink’s legacy is a movement for peace, harmony and reconciliation between Turks and Armenians. His death is memorialized around the globe each year. This image is from the Pergamon marble altar originally built by the Greeks in the second century B.C. in Pergamon, now Bergama, Turkey.The frieze depicts the war between the Greek gods and the giants. This particular detail from the North Frieze shows the death of Chthonios, presenting the familiar theme of a life taken too soon, from someone in the bloom of youth. This distinctive church with Mount Ararat in the background miraculously still exists today; it persists as an emblem of Armenian identity. Mount Ararat is a national symbol of Armenian identity and is found on the Armenian coat of arms. In their mythology, it was the home of the gods. Over 5,000 m. in height, Ararat dominates the countryside. It is said to be the final resting place for Noah’s Ark. Over the flag is superimposed a candle flame and the date of the largest massacre, April 24, 1915. The colours of the flag are used throughout the painting. Two hundred thousand protesters and mourners filled the streets of Istanbul. This event, an international news item, was the original inspiration for this composition. This figure has witnessed horrific events and survived, haunted by memories she cannot suppress. Beneath the surface of the composition there is a piece of lace; it lies flat in some places and falls into folds in others. Its placement and dimension in the composition is random. This lace can allude to many things – domesticity, culture, harmony, comfort, order, memory, prosperity: all things Armenians were forced to abandon. The map marks the sites of concentration camps and massacres. It also indicates routes used to march the able-bodied out of the country. The map reveals the enormity of the devastation. Aurora Arshaluys Mardiganian, born in Turkey in 1901, not only survived the massacre but after immigrating to Los Angeles in 1917 made a documentary film about it. She also starred in “Ravished Armenia,” which opened in 1919. A posting of portraits in this fashion has become a familiar sight, usually to denote the dead, the “missing” or the “disappeared.” In this case, the individuals managed to survive, bear witness and continue the Armenian legacy.